Background: Human epidermal growth factor receptor 2 (HER2)/neuprotooncogene (neu) is a proven molecular prognostic marker in breast, ovarian, gastric, and ovarian cancers. In head-and-neck cancers, varied expression is documented and therefore its prognostic role is debatable. Aim of the Study: To find the rate of overexpression of HER2/neu in head-and-neck cancers and to understand its prognostic role by evaluating its association with nodal stage and overall stage of the patient. 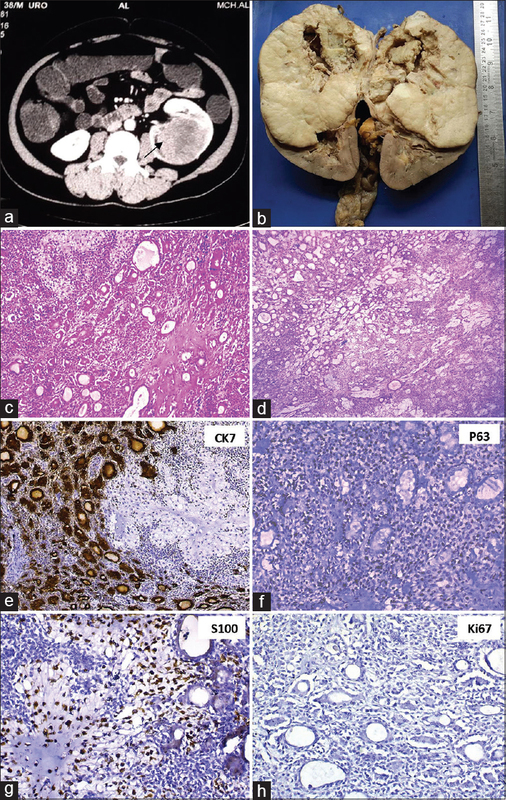 Methodology: A total of 70 surgically resected cases of head-and-neck cancers were evaluated for expression of HER2/neu by immunohistochemistry. Scoring was done according to the American Society of Clinical Oncologists/College of American Pathologistsguidelines for Her2/neu testing in breast cancer. Results: Of the 70 cases studied, 57 were of oral cavity and 13 were laryngeal squamous cell cancers and 14 (20%) were Her2/neu positive. On correlating the expression of HER2/neu in T1/T2 (41 cases) versus T3/T4 (27 cases), the P value was found to be 0.8273 which was statistically insignificant. Furthermore, no statistically significant difference in expression of HER2/neu was found in between node negative and node positive cases (49 vs. 19 cases, respectively), with P = 0.512. Conclusion: In the current settings, HER2/neu is not found to be a prognostic marker in head-and-neck cancers. 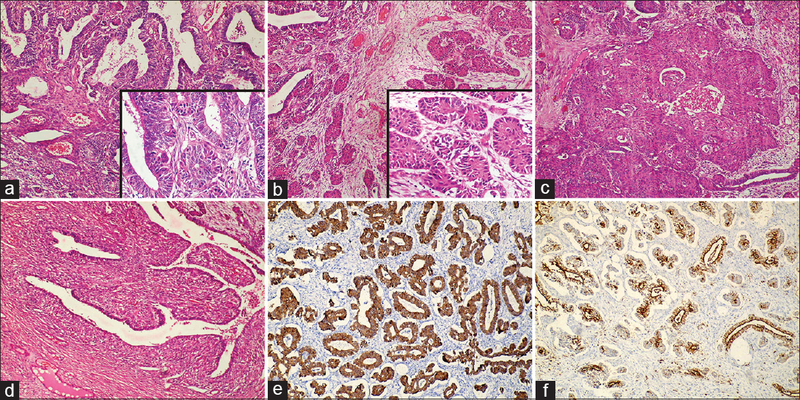 Standard immunohistochemistry staining protocols need to be established like in breast cancers to aid uniform reporting and further evaluate the role of this important protooncogene in head-and-neck cancers. Background: Investigation of morphological differences in relation with serological variables between primary versus secondary Sjögren's syndrome associated with systemic scleroderma (Scl-SS). Materials and Methods: A total of 69 primary Sjögren's syndrome (pSS) and Scl-SS patients were grouped according to the American–European Consensus Group criteria. Serum autoantibody information was obtained from the patient records. Hematoxylin and eosin sections of the minor salivary gland biopsy were reevaluated, and the lymphocyte focus score (FS), plasma cell focus, and fibrosis rates were all evaluated. Results: There were 43 pSS and 26 Scl-SS cases. Both biopsy and autoantibody were positive in 16 pSS cases while only biopsy was positive in 25 cases and only antibody in 1 case. Both biopsy and antibody were positive in 5 Scl-SS cases while only biopsy was positive in 18 and only antibody in 3 cases. The plasma cell focus was statistically significantly higher in pSS cases (P = 0.003). No difference was seen between Sjögren' syndrome (SS) subtypes in terms of lymphocyte FS, fibrosis, and autoantibody positivity. Conclusion: We found that plasma cell focuses could be found more frequently in pSS than Scl-SS. In addition, our study reveals that the coexistence of SS and systemic scleroderma decreases the incidence of FS value ≥1 compared to pSS. Background/Aims: Human epididymal secretory protein 4 (HE4) is originally described as an epididymis-specific protein but more recently suggested to be a putative serum tumor marker for some tumors, including breast carcinomas. In this study, we aimed to investigate the interactions between HE4 expression and molecular subtypes of breast carcinomas. Methods: HE4 expressions were studied in 242 formalin-fixed, paraffin-embedded breast carcinoma specimens and their association with different pathological and clinical parameters was evaluated. Results: Immunohistochemical (IHC) staining for HE4 was negative in 3 (1.2%) cases, weakly positive (1+) in 7 (2.9%) cases, moderately positive (2+) in 58 (24.0%) cases, and strongly positive (3+) in 174 (71.9%) cases. 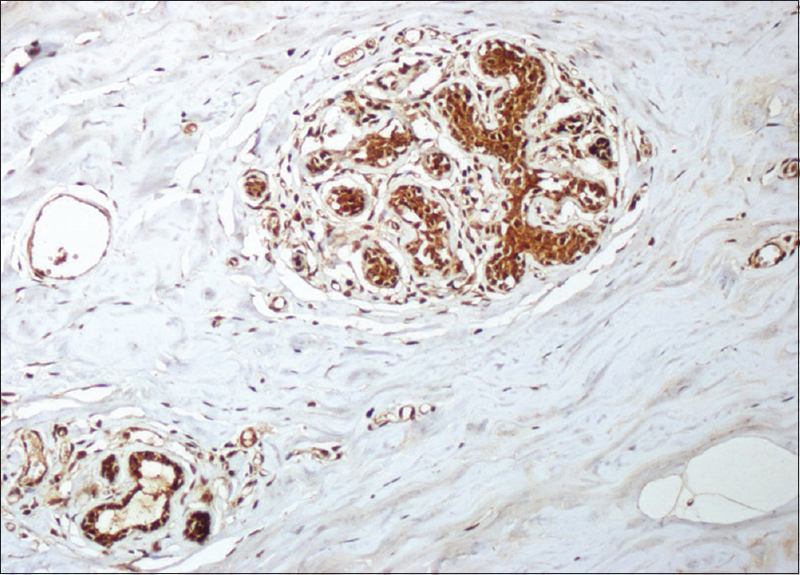 A correlation between IHC HE4 staining grade and molecular groups was detected (P = 0.005). 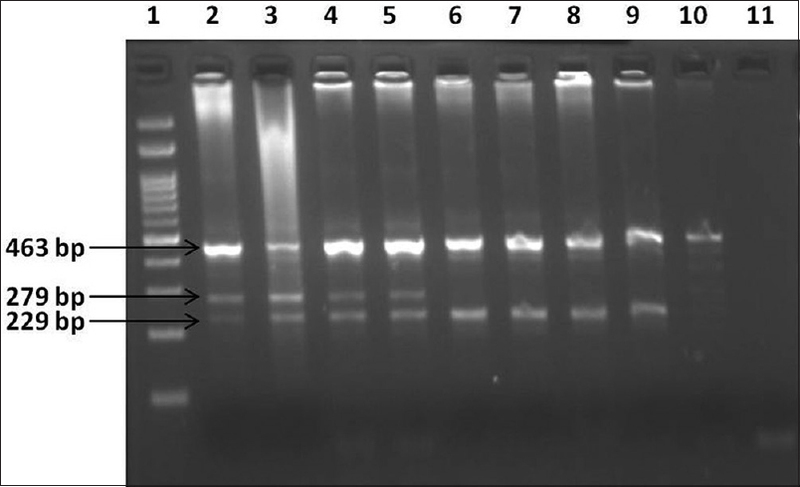 Furthermore, it was found that HE4 expression was strongly associated with histological tumor grade, c-erbB2 expression, and positive fluorescence in situ hybridization test results that detect human epidermal growth factor receptor 2 (HER2)/neu amplification (P = 0.022, P = 0.014, and P = 0.011). Conclusion: This study showed that HE4 expression is associated with HER2/neu amplification in breast cancers. These results may be commented as HE4 expression rises in patients with HER2/neu amplification. As is known, HER2/neu amplification is a poor diagnostic factor in breast cancer and HE4 expression is possibly associated with poor prognosis. Context: Neonatal period is the single most hazardous period of life. The major causes of neonatal death are prematurity and respiratory distress syndrome. We report a series of neonatal autopsies in our Neonatal Intensive Care Unit with special emphasis on pulmonary pathology. The spectrum of pathological changes in the lungs and thyroid transcription factor-1 (TTF-1) expression was studied in detail with reference to its spatial distribution. 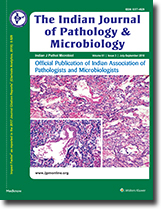 Aims: This study aims to analyze the causes of neonatal death with special attention to pulmonary pathology along with associated histopathological changes in lungs. We also evaluated the expression of TTF-1 at different levels of the airway. Materials and Methods: After taking consent and anthropometric measurements, autopsy was performed. 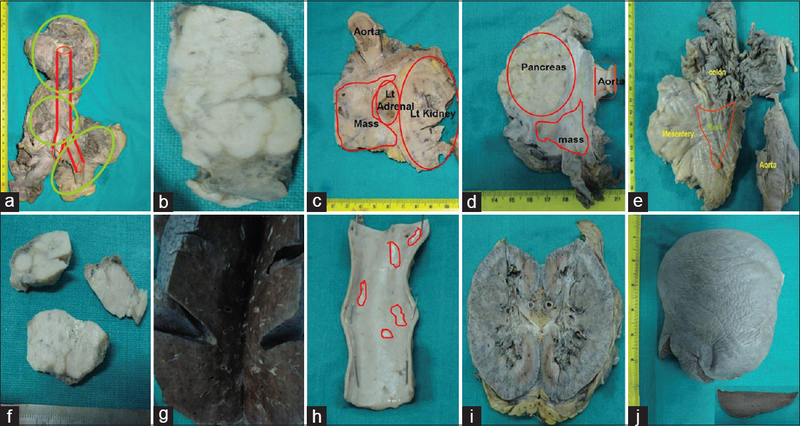 Weights of all organs were taken, and histological sections were examined under hematoxylin and eosin stain. TTF-1 immunostaining was done on lung sections. Localization of TTF-1 was evaluated at the intrapulmonary level of terminal bronchioles (TBs), distal bronchioles, and alveoli. Results: We performed a series of 25 autopsies in neonates. In our series, most of the neonates were preterm (64%), had low birth weight (44%), and died within the first 7 days of life (80%). Majority (60%) of the neonates died due to pulmonary causes, followed by septicemia (24%), congenital anomalies (12%), and birth injury (4%). Among the respiratory causes, hyaline membrane disease (HMD) was diagnosed in maximum number of cases (32%), followed by pneumonia (12%) and pulmonary hemorrhage (12%). The TTF-1 expression in TBs, distal airways, and alveoli was significantly reduced or absent in cases of HMD compared to the control group. Conclusions: In this study, we observed that HMD is the most common cause of perinatal death among respiratory disorders, and in this disease, the expression of TTF-1 is significantly reduced in TBs, distal airways, and alveoli compared to the control group. Background: Nerve biopsy has been widely used to investigate patients with peripheral neuropathy and in many centers, it is still a part of the diagnostic armamentarium. 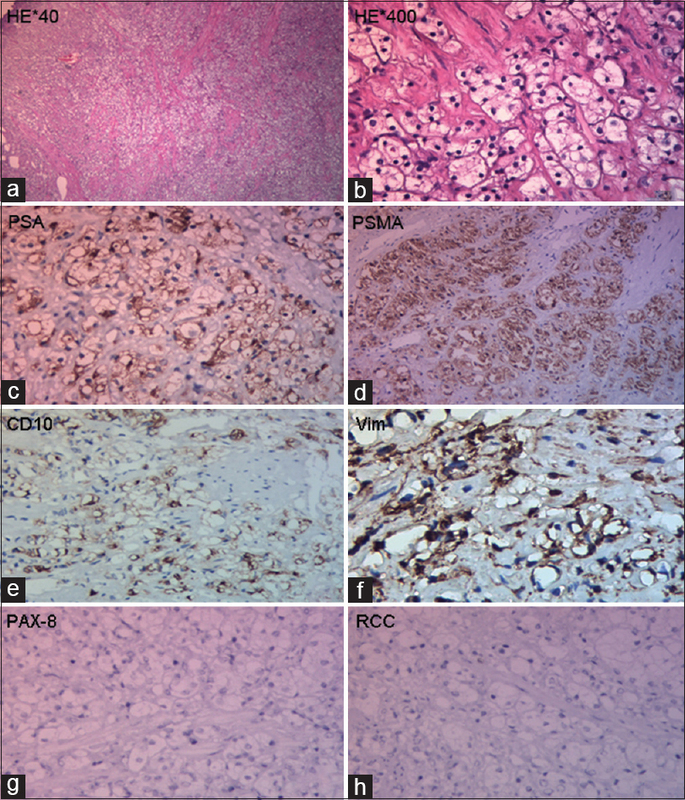 In this study, the histopathological spectrum of the nerve biopsies received is being revisited to analyze the various clinical and pathologic features and also to assess their relevance. Materials and Methods: Retrospective analysis of the data retrieved was done for 74 cases of nerve biopsies. Results: On the basis of the data and histopathological features, broad diagnoses were obtained in 52 cases and further categorized into biopsies being supportive for patient management (including acute and chronic axonopathies and demyelinating neuropathies) and biopsies considered essential for patient management (including vasculitic neuropathies, leprous neuropathies, hereditary neuropathies, and chronic inflammatory demyelinating neuropathies). Nine nerve biopsies did not show any abnormal histopathological features, while 13 nerve biopsies were found to be inadequate for diagnosis, both these groups were categorized as noncontributory. Conclusion: With advanced nerve conduction studies available, nerve biopsy is losing its relevance. However, in our experience, nerve biopsy did complement the clinical findings and nerve conduction studies, with which a close correlation is required to make the histopathology of nerve biopsy more relevant in terms of guiding further specific workup and management. Background and Aims: Liver biopsy may be considered in patients with hepatitis C virus (HCV) infection to assess the severity of liver injury and stage of fibrosis, thereby guiding therapeutic decisions. In addition, advanced stage also necessitates surveillance for hepatocellular carcinoma. The aim of this study was to assess whether transaminase (alanine transaminase [ALT]) levels and RNA titers correlate with the histological activity index (HAI) and fibrosis (F) stage in asymptomatic patients with incidentally detected HCV (IDHCV). Patients and Methods: Retrospective evaluation of liver biopsies was done in 113 patients with IDHCV, diagnosed during routine screening. Decision of liver biopsy was made on the basis of age, genotype, acceptable clinical, hematological, and biochemical profiles, and willingness of the patients to undergo treatment. Serum ALT levels, HCV RNA titers, and genotypes were correlated with HAI and F stage. Results: Genotyping was done in 77 of the 113 patients, of which genotype 3 was seen in 43 and genotype 1 in 25 patients. A higher fibrosis stage (Ishak's >F2) was noted in 23.8% of the biopsies. Serum ALT showed a significant correlation with the HAI score on liver biopsy (P = 0.01) but not with the stage of fibrosis (P = 0.52). HCV RNA titers did not reveal any correlation with HAI score or fibrosis stage. Conclusion: Serum transaminases and HCV RNA titers are poor predictors of disease severity and fibrosis. Since HCV shows a slow disease progression, higher stage may predict a worse prognosis irrespective of the low viral RNA load. 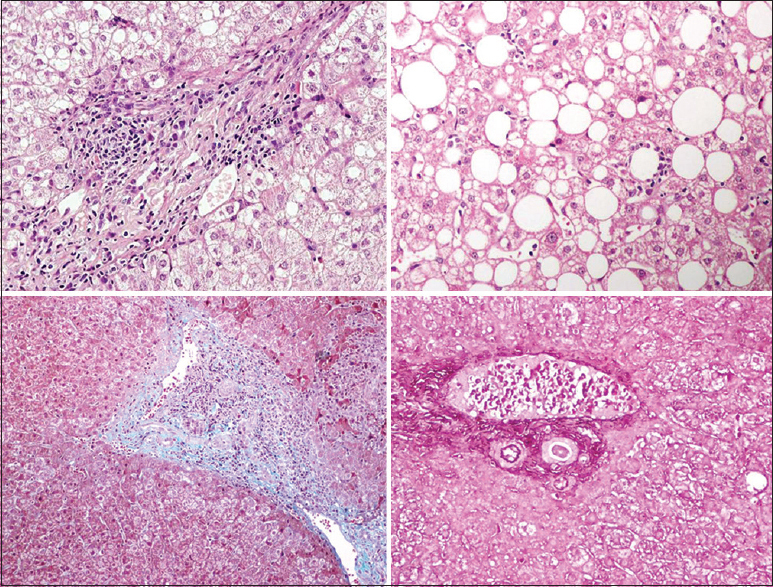 Liver biopsy may help guide therapeutic decisions in IDHCV infection. Background: Mucins may show aberrant expression, localization, and/or glycosylation in multiple malignancies. However, information regarding expression of these mucins is mostly unknown in urothelial tumors. Aim: This study was conducted for examining the expressions of membrane associated and secreted mucin (MUC1) and a secreted gel-forming mucin (MUC2) in urothelial tumors of the urinary bladder. Subjects and Methods: Archival transurethral resection materials of 97 urothelial carcinoma cases were reexamined light microscopically and graded according to the 2004 WHO Classification. Pathological stage was given as pTa, pT1, and pT2. Demonstrative sections were recut for immunohistochemistry for MUC1 and MUC2. The results were statistically analyzed, and P < 0.05 was considered statistically significant. Results: The positivity for MUC1 and MUC2 was 89.7% and 44.3%, respectively. Independent from pathological stage of the tumor, MUC1 expression showed statistically significant correlation with tumor grade (P < 0.05). We did not find any correlation between pathological stage and MUC1 and MUC2 expression (P > 0.05). MUC1 staining pattern in papillary urothelial neoplasm of low malignant potential cases was more commonly apical and superficial (luminal cell layer only). Intermediate cells ± basal cells or isolated cells or islands of tumor cells with cytoplasmic and/or circumferential membrane positivity for MUC1 and MUC2 were more commonly observed in both low- and high-grade carcinomas. The difference between groups in terms of MUC1 and MUC2 staining was statistically significant (P < 0.05). Conclusions: The staining patterns of both mucins are different between urothelial papillary tumors and may be used to make a differentiation, especially for low-grade papillary urothelial lesions. This difference may also be important in the carcinomatous transformation of urothelial neoplastic and preneoplastic lesions. Context: The provision of initial treatment to a patient with suspected meningitis depends greatly on early recognition and rapid diagnostic evaluation of cerebrospinal fluid (CSF) leukocytes, proteins, and glucose. The diagnosis is time critical and timely intervention has an implication on the prognosis and outcome. Reasonably, sound laboratorial setups are not available in our country in the primary health-care level and, even in the settings where they are available, long waiting periods precede the availability of results. Aims: We conducted this study to emphasize the role of urine reagent strip test as a rapid diagnostic tool in CSF analysis. Settings and Design: This is a prospective single-blinded study on 100 consecutive CSF samples received with in 1h of tap. Subjects and Methods: All the 100 samples were subjected to definitive test being CSF microscopy and biochemical analysis of proteins and sugar and index test being a semi quantitative analysis of CSF leukocytes, proteins, and sugar by urinary reagent strips. Statistical Analysis Used: The diagnostic accuracy of the reagent strip for different cutoff levels was estimated and tabulated in the form of sensitivity, specificity, positive predictive value, negative predictive value, and likelihood ratio. Results: 77% of cases were in the pediatric age group and 23% cases were adults. 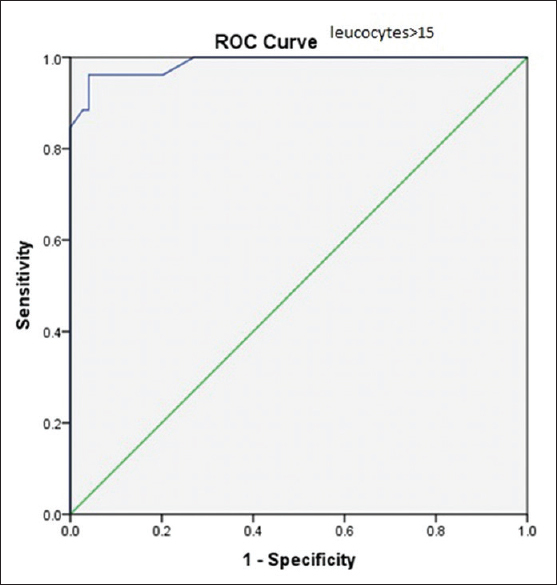 The sensitivity and specificity for leukocytes by the strip method for ≥15 cells/cumm were 89.28% and 98.61%, respectively, which increased to 100% with an increase in the counts. The reagent strip test had a sensitivity of 85.71% and a specificity of 95.65% for the protein levels >30 mg/dl which increased to 100% with an increase in protein levels. The reagent strip test for glucose was highly specific (100%) but less sensitive. Conclusions: The results indicate that urine reagent strip is instrumental in bedside CSF analysis and has a future stand in the diagnosis of meningitis. Context: The International Consensus Group for Hematology Review (ICGHR) are essentially review criteria designed to reduce the number of manual smear reviews following analysis in automated hematology analyzers (AHAs). Although AHAs are an indispensable part of the present-day clinical laboratory, manual smear reviews still play an integral role in identifying morphological abnormalities and to confirm the results of the analyzers. Aims: The aim of this study is to evaluate the efficacy of the ICGHR criteria and our laboratory criteria using the Sysmex XN-1000 for manual peripheral smear review (MSR). Study Design: A prospective cross-sectional comparative study between the two sets of criteria for MSR was performed. Material and Methods: A total of 860 whole blood samples sent over a period of 19 months for complete blood count testing to our laboratory were collected using systematic random sampling. Truth tables were prepared for each set of criteria. Tests of proportion were used to compare performance specifications between both sets of criteria. Results: Using ICGHR criteria, sensitivity was 81.58%, specificity was 84.61%, 83.38% positive predictive value, and 82.92% negative predictive value. The microscopic smear review rate was 47.56% and efficiency was 83.14%. Using our laboratory criteria, sensitivity was 98.80%, specificity was 41.40%, positive predictive value of 61.46%, and negative predictive value of 97.34%. The microscopic smear review rate was 78.14% and efficiency 69.30%. Conclusions: There was a significant reduction in the microscopic smear review rates using the ICGHR criteria compared to our laboratory criteria. 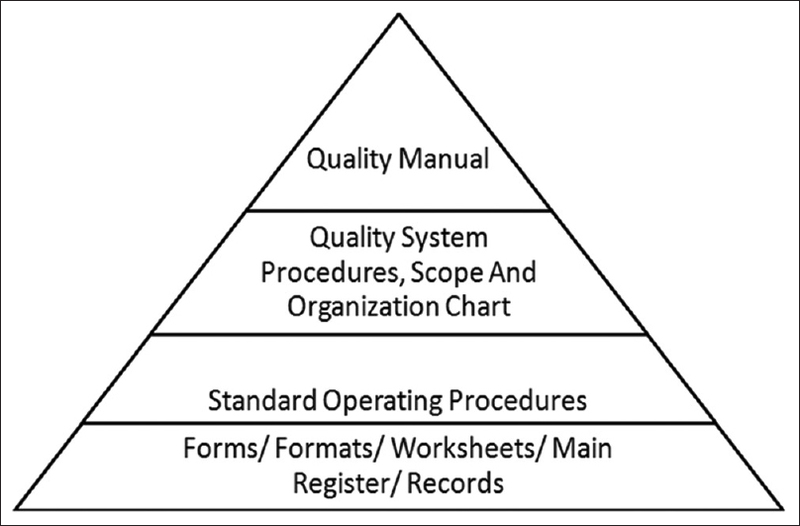 The ICGHR criteria can thus be adapted to daily laboratory practice provided they are first optimized and locally validated before use. Introduction: The platelet function disorders remain largely undiagnosed or incompletely diagnosed in developing nations due to lack of availability of tests like lumiaggregometry, granule release assay or molecular testing. We performed a retrospective analysis of all the platelet function test (PFT) carried out in past 5 years by Light transmission aggregometery (LTA) using a panel of agonist. The indications and the test results were analyzed by two hematopathologist with the aim to look into the present diagnostic facilities or lack of it for correct diagnosis. This is essential for better management and genetic counselling. 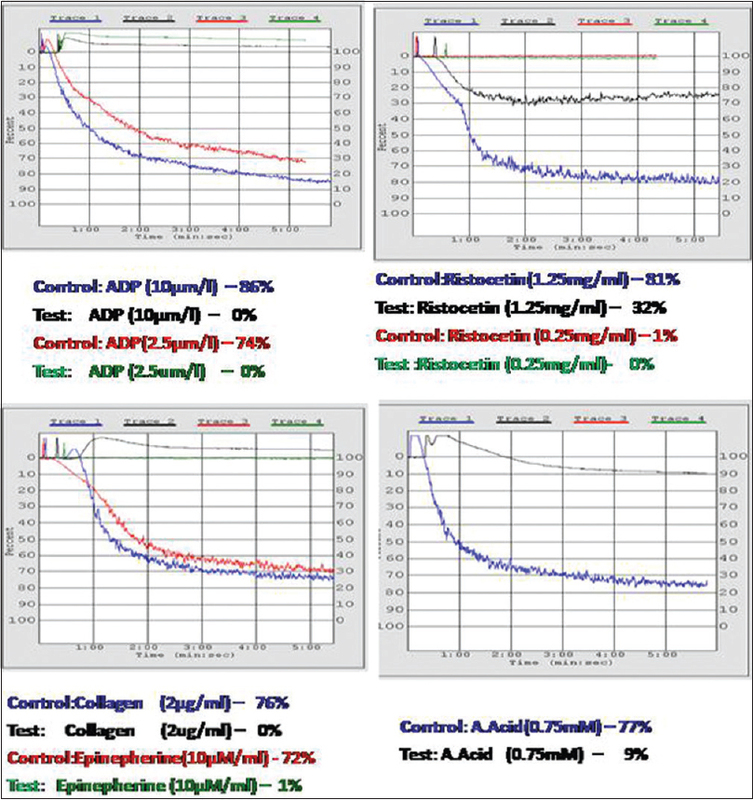 Materials and Methods: The PFT was performed both on patients and healthy unrelated age specific controls by light transmission aggregometry on Chronolog platelet aggregometer using platelet rich plasma. The panel of agonists included ADP (10μm/l and 2.0 μm/l), epinephrine (10.0 μm/l), collagen (2μg/ml), arachidonic acid (0.75 mM) and ristocetin (1.25 mg/ml & 0.25 mg/l). Results: The 5 years records of 110 cases were audited, 101 of these were tested for clinical bleeding , 35 adults and 66 children. The adults included 29 women and 6 men, 17 to 82 years of age. The children were 16 years to 3 months of age, 30 girls and 36 boys. Platelet function test abnormality was found in 31.6% (32/101) cases ,a majority remained undiagnosed of these about 21% had clinically significant bleeding.The cases diagnosed included Glanzmann Thromboasthenia-11 , von Willebrand Disease-6, Bernard Soulier'syndrome-1, storage pool disorder-6, mild defect of Epinephrine-3, isolated defect with collagen in1. Conclusion: An epidemiologically large proportion of platelet function disorders amongst people living in developing nations remain undiagnosed. This lacunae needs to be highlighted and addressed on larger scale. The options available are to increase the available armamentarium of tests or international collaboration with a specialized laboratory to aid in complete diagnosis. Background: It is still a matter of debate regarding the association of JAK2V617F mutation with thrombosis in BCR-ABL negative CMPN patients. The role of JAK2V617F mutation in increasing the thrombotic risk in CMPNs is yet unequivocal. Aims: To clarify the contribution of JAK2V617F mutation in thrombosis in CMPN patients. Settings and Design: This retrospective study was done to evaluate role of JAK2V617F mutation in thrombosis in CMPNs. Materials and Methods: 65 CMPN patients (PV, ET and PMF) were analyzed for JAK2V617F mutation using ARMS-PCR and detailed history of thrombosis was recorded in these patients. Statistical Analysis: P values were 2 tailed, and statistical significance was set at P < 0.05. Results: 46/65 were males and 19/65 were females [M: F: 2.4:1] with median age 46 years [range, 14-80 years]. Patients had median Hb 15.6 g/dl [range, 5.1-20.3], median TLC 10.7 × 109/l [range 2.4-216] and platelet count 360 × 109/l [range, 20-1859]. 32 were JAK2V617F positive and 33 were negative for this mutation. On comparing the prevalence of thrombosis in JAK2V617F positive patients with JAK2V617F negative patients, we observed that 20/32 (62.5%) JAK2V617F positive patients had thrombosis as compared to 16/33 (48%) in JAK2V617F negative patients (P = 0.04). We observed significant association of JAK2V617F mutation with thrombosis, however no association of this mutation with thrombosis was observed among the JAK2V617F negative patients. Conclusion: Our study suggests that JAK2V617F mutation may increase the risk of thrombosis in CMPNs. This finding could lead to risk stratification, setting up the treatment strategy in CMPNs. Background: Ventilator-associated pneumonia (VAP) is the most frequent intensive care unit (ICU)-acquired infection. The etiology of VAP and their antimicrobial susceptibility pattern varies with different patient populations and types of ICUs. Materials and Methods: An observational cross-sectional study was performed over a period of 2 years in a tertiary care hospital to determine the various etiological agents causing VAP and to detect the presence of multidrug-resistant (MDR) pathogens in these VAP patients. Combination disk method, Modified Hodge test, ethylenediaminetetraacetic acid disk synergy test, and AmpC disk test were performed for the detection of extended-spectrum beta-lactamase (ESBL), carbapenemases, metallo-beta-lactamases (MBL), and AmpC beta-lactamases, respectively. Results: The prevalence of VAP was 35%. Enterobacteriaceae (66.66%) and Staphylococcus aureus (20%) were common in early-onset VAP, while nonfermenters (50%) and Enterobacteriaceae (40.61%) were predominant from late-onset VAP. Nearly 60.87% of the bacterial pathogens were MDR. ESBL was produced by 21.74% of Enterobacteriaceae. AmpC β-lactamase was positive in 35.29% nonfermenters and 26.08% Enterobacteriaceae. MBL was positive in 17.64% nonfermenters and 17.39% Enterobacteriaceae. Among the S. aureus isolates, 75% were cefoxitin resistant. Prior antibiotic therapy (P = 0.001) and hospitalization of 5 days or more (P = 0.001) were independent risk factors for VAP by MDR pathogens. polymyxin B, tigecycline, and vancomycin were the most sensitive drugs for Gram-negative and positive isolates respectively from VAP. Statistical Analysis: SPSS for Windows Version SPSS 17.0 (SPSS Inc., Chicago, IL, USA) and Chi-square with Yates correction. Conclusion: Late-onset VAP is increasingly associated with MDR pathogens. Treatment with polymyxin B, tigecycline, and vancomycin should be kept as last-line reserve drugs against most of the MDR pathogens. Objective: The objective of this study is to retrospectively evaluate follicular variant of papillary thyroid carcinoma (FVPTC) and reclassify encapsulated FVPTC as noninvasive follicular thyroid neoplasm with papillary-like nuclear features (NIFTP) according to the criteria proposed by The Endocrine Pathology Society working group in 2015 to correlate with outcome. 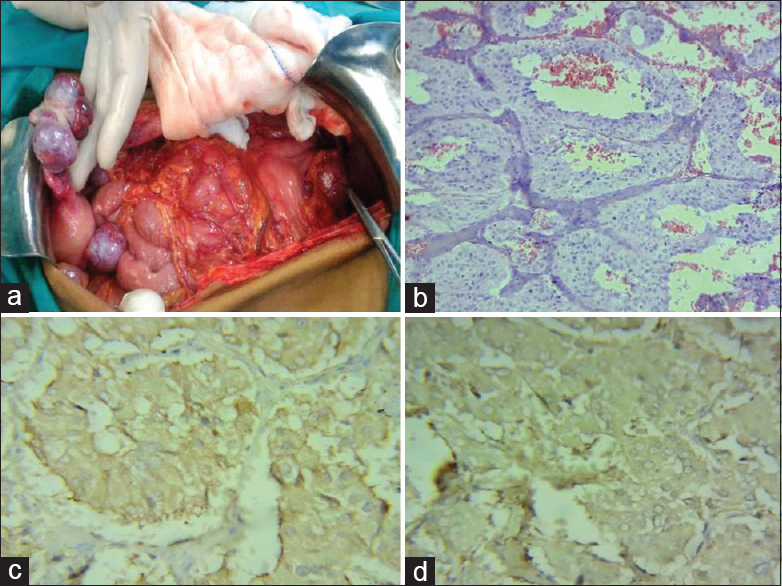 Materials and Methods: Retrospective review of case records of all patients diagnosed as carcinoma of thyroid between 2015 and 2016 was done for the histologic subtype. 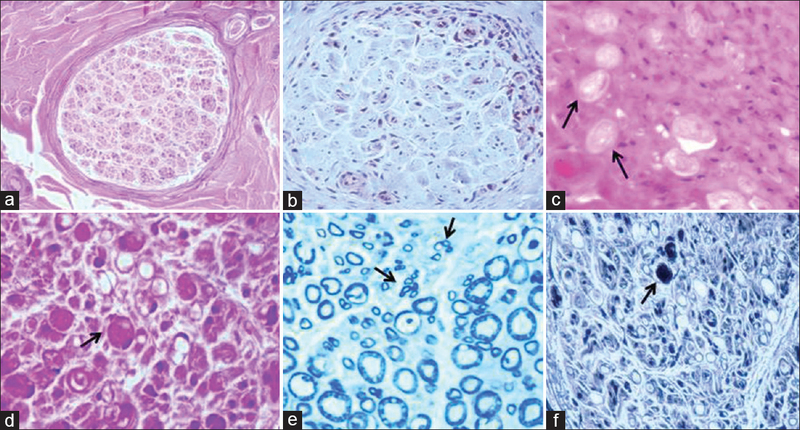 Gross and microscopic features on resected specimens of FVPTC were reviewed and subtyped as invasive and encapsulated based on capsular/vascular invasion; the encapsulated forms were further studied for size, number, follicular architecture, nuclear features, presence of psammoma bodies, stromal fibrosis, necrosis, mitoses, and lymph node status. Results: Out of the 383 patients with thyroid carcinomas in the study period, 349 were PTC which included 106 FVPTC. Thirty-three patients fulfilled the criteria to be labeled as NIFTP. Total thyroidectomy was performed in 8 patients and hemithyroidectomy in 25 patients. Lymph node dissection along with total thyroidectomy was done in 3 and completion thyroidectomy following hemithyroidectomy was done in 9. There were 29 single and 4 multiple lesions with size varying from 0.2 to 7 cm including 5 lesions measuring <1 cm. 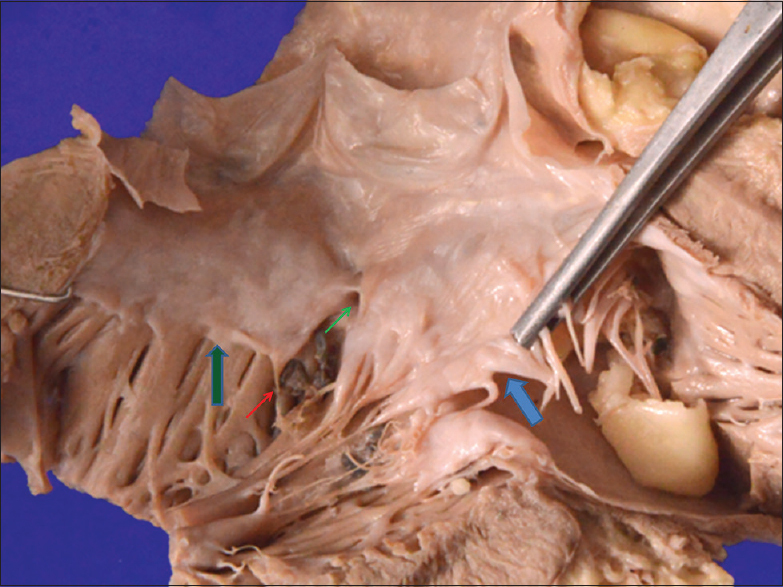 The involvement was confined to one lobe in 31 and both lobes in 2 specimens. Patients are on follow-up with no recurrence till date. Conclusion: Thyroid carcinomas currently diagnosed as FVPTC should be evaluated for criteria of NIFTP to avoid overtreatment as they have an indolent behavior. Tuberculosis (TB) and Non-Hodgkins lymphoma (NHL) share similar clinical and radiological features, which make diagnosis a challenge. It is often difficult to rule out a diagnosis of extrapulmonary and/or disseminated TB because of its paucibacillary nature and difficulty in accessing the involved organs. In countries with high prevalence of TB like ours, empirical antitubercular treatment (ATT) is started, and the patient is followed up closely for response. We present a rare case of a 54-year old diabetic male who was suspected to be a case of disseminated TB but had a rapid downhill course despite ATT. A postmortem revealed features of a rare, aggressive T-cell NHL masquerading as disseminated TB. Hypophysitis of the pituitary gland is a rare inflammatory disorder and broadly classified as primary and secondary hypophysitis. Primary hypophysitis is mainly of lymphocytic, granulomatous, and xanthomatous types. Among the various primary hypophysitis, granulomatous hypophysitis is rare type with an incidence of 1 in 10 million. The various forms of hypophysitis are misdiagnosed as pituitary adenoma in 40% cases. 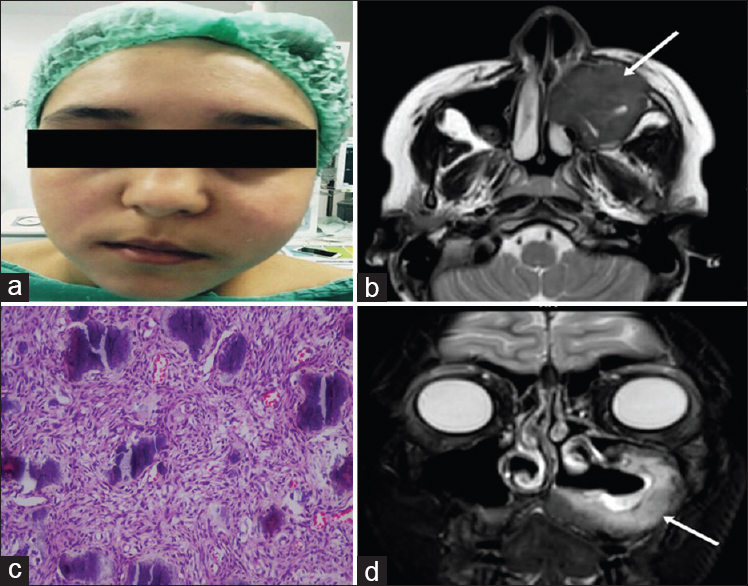 Idiopathic granulomatous hypophysitis is even rarer inflammatory disorder accounting for <1% of cases involving panhypopituitarism with headache and visual disturbances. We report idiopathic granulomatous hypophysitis in a 28-year-old female presenting with blurring of vision and headache. 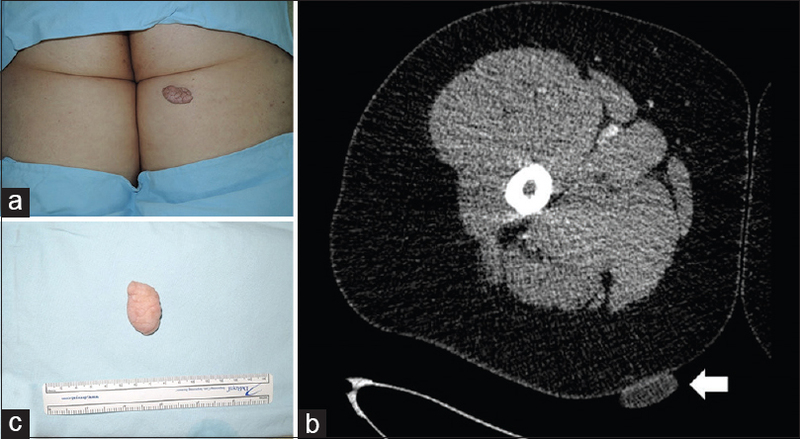 Chronic radiodermatitis is a rare complication of fluoroscopy-guided procedures. The diagnosis of fluoroscopy-induced chronic radiation dermatitis is challenging because of its rarity, late insidious onset, and close clinicopathological resemblance to morphea. We report two cases of fluoroscopy-induced chronic radiodermatitis following cardiac procedures to highlight the clinicopathological features. 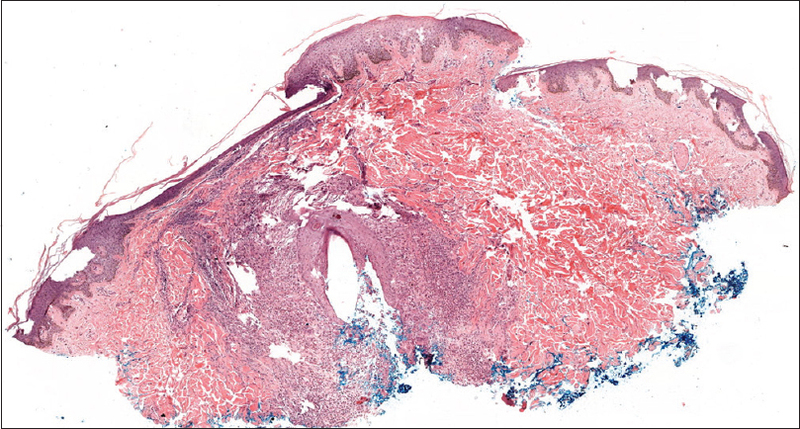 The diagnosis relies on recognizing the characteristic clinical presentation of well-demarcated, rectangular- or square-shaped indurated plaque with depigmentation, telangiectasia, and ulceration located on the scapula, back, or axilla; supported by the histological identification of radiation fibroblasts in a sclerotic dermis. Salivary gland tumors are clinically diverse group of neoplasms, of which pleomorphic adenoma and mucoepidermoid carcinoma (MEC) are most common benign and malignant tumors, respectively. Besides the major salivary glands, these tumors can affect the minor salivary gland tissues in the posterior part of the hard palate. Minor salivary gland tumor accounts for about 15% of all the salivary gland neoplasm, of which MEC accounts to about 35.9%. MEC appears as asymptomatic swellings and shows a variety of biological behaviors and variable natural history. This article reports a case of MEC involving the posterior part of the hard palate. The lesion was treated by wide surgical excision with a regular follow-up and no recurrence was noted. Metastasis to the thyroid is uncommon. Mostly, they are tumors that originate in the lung or head or neck. Metastases from breast or kidney carcinomas and metastatic melanoma have also been reported. Autotransplantation of benign thyroid tissue is a surgical procedure designed to achieve normal thyroid hormonal status following surgery. Metastasis into autotransplanted thyroid tissue has not been reported earlier. We report a case of squamous cell carcinoma (SCC) metastatic to autotrasplanted thyroid diagnosed on fine-needle aspiration. Further workup revealed a primary oral cavity SCC. Mixed endocrine–nonendocrine neoplasms are rare tumors and pose challenges in diagnosis and management. Neurofibromatosis-1 (NF-1) patients are known to develop malignancies. Although neuroendocrine tumors and gastro-intestinal stromal tumors are seen in NF-1, its association with adenocarcinoma is rare. The existence of these three entities with NF-1 is extremely rare. NF1 patients presenting with symptoms suggestive of malignancies should alert the physician for a detailed clinical work up. Diagnosis of these malignancies often requires a meticulous histopathological and immunohistochemical examination. We report the first case from Indian experience. Paragangliomas (PGLs) are rare tumors of neural crest origin, with a malignancy rate of approximately 10% and a 5-year survival rate of <50%. 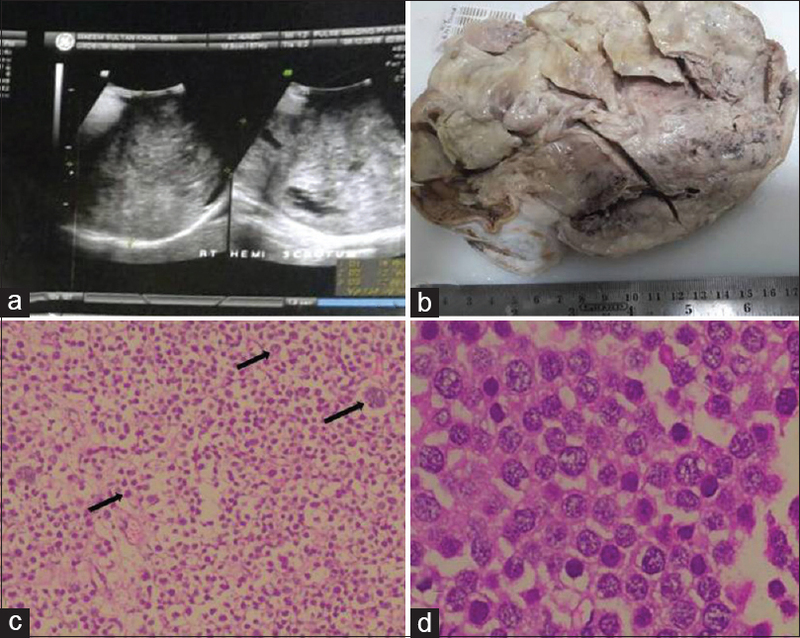 We present a case of malignant PGL arising from the porta hepatis with metastasis to the portal lymph node and bilateral ovaries. PGLs arising from the porta hepatis are very rare. As per our knowledge, only three cases of hepatic duct PGL have been reported. It is important to detect it earlier because the treatment modality and prognosis of benign and malignant PGL differs and defines the prognosis of the patient. Sclerosing pneumocytoma (SP) is an uncommon benign tumor, and metastasis of SP has been rarely reported. 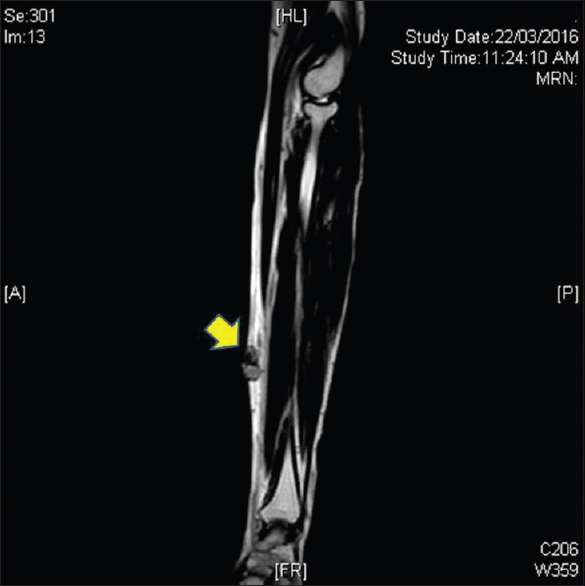 Here, we report the case of a 26-year-old woman with surgically confirmed SP. The tumor diameter was 40 mm, and metastasis to mediastinal and regional lymph nodes was observed. Immunohistochemically, both surface and round cells were positive for epithelial membrane antigen, thyroid transcription factor 1, and vimentin. Only surface cells expressed creatine kinase, carcinoembryonic antigen, napsin A, and cytokeratin 7, and only round cells expressed progesterone receptor. Ki-67 was detected in ~3% of cells, and the rate of weak positive p53 staining was 3%. Both cell types were negative for chromogranin A, synaptophysin, CD3, and CK20. Multiple metastases in a young SP patient are very rare, and potential mechanisms of metastasis may be related to epithelial–mesenchymal transformation. Cystic renal masses pose diagnostic challenge especially when they belong to Bosniak Type II and III. 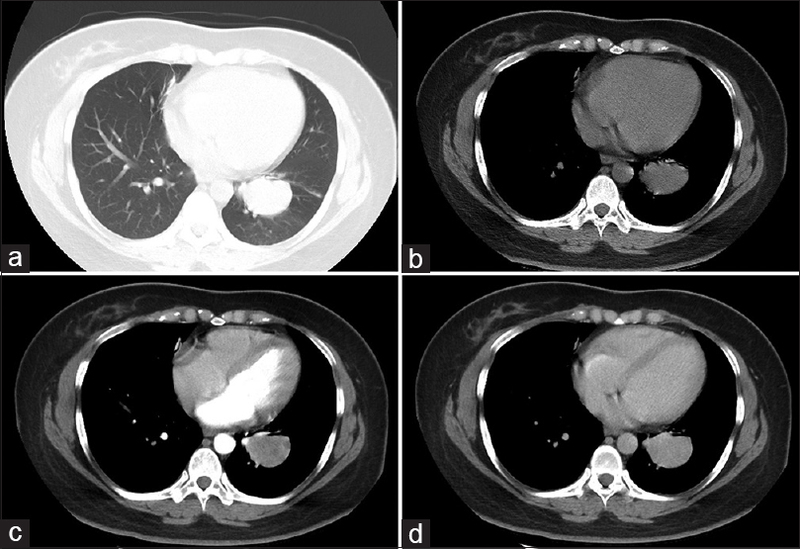 Septal and nodular enhancement on computed tomography (CT) is the strongest predictor of malignant process. A unilocular cyst with a calcified rim or a multilocular cystic lesion with heterogeneity on CT goes in favor of hydatid disease. 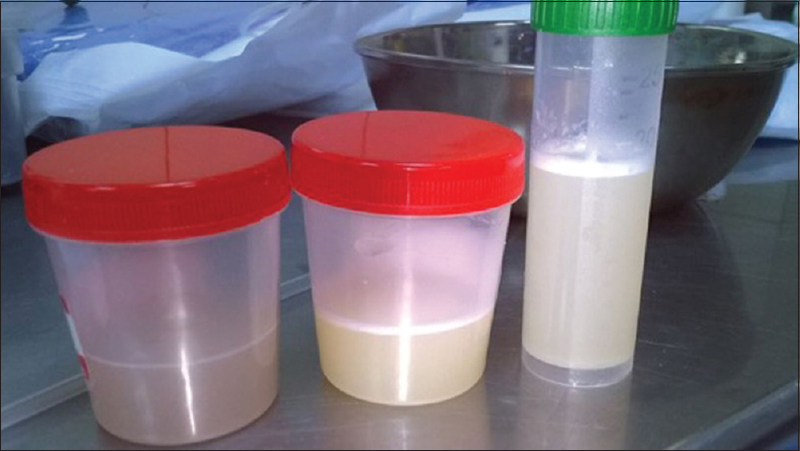 We report a case in a 65-year-old female who presented with painless hematuria, was found to have a cystic mass in the right kidney. The mass turned out to be collecting duct carcinoma after histopathological examination though imaging studies were in favor of a hydatid cyst. Kyrle's disease (KD) is a rare skin pathology characterized by transepidermal elimination of abnormal keratin. The aim of this article is to report a rare case of KD associated with diabetes mellitus, chronic kidney disease, and HIV. A 51-year-old male patient complained of diarrhea for 8 months. He was submitted to HIV testing, which showed a positive result. He started antiretroviral therapy with zidovudine, lamivudine, and lopinavir. The diagnostic investigation was negative for opportunistic diseases. 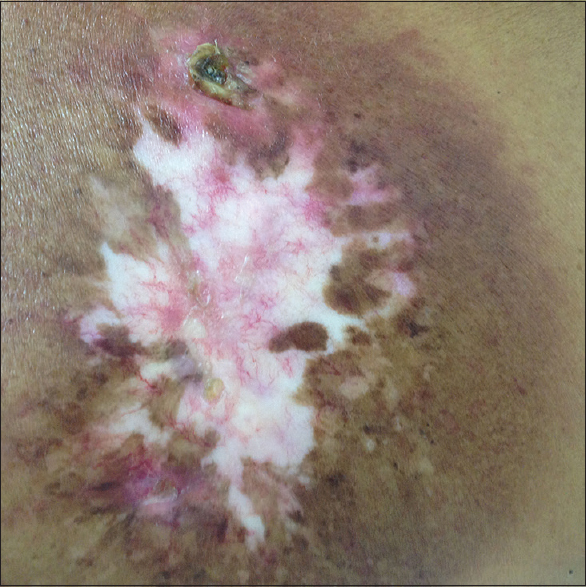 After 2 months, skin lesions started appearing, characterized by hyperchromic, pruritic macules and papules distributed in the trunk, back, and upper limbs. He also developed erythematous, scaly lesions in the facial region. A biopsy of the skin was performed, of which histopathological report consisted of perforating disorder, favoring a diagnosis of KD. Treatment with keratolytic soap (Actine) was started, with skin lesion improvement. In this reported case, it is possible that, in addition to diabetes and renal failure, HIV infection played an important role in the genesis of the lesions. Pulmonary alveolar proteinosis (PAP) – an unusual diffuse lung disease characterized by alveolar accumulation of phospholipoprotein material, with a peak incidence in third to fourth decade and male predominance is also described in children. Recorded prevalence is 0.1/100,000 individuals. Major clinicopathogenetic subtypes include autoimmune (idiopathic) associated with granulocyte–macrophage colony-stimulating factor autoantibodies, secondary form, and the congenital form (associated with surfactant gene mutations). Common presenting features include dyspnea, cough, low-grade fever, inspiratory crackles, and digital clubbing. Pulmonary function shows a restrictive ventilatory defect. X-rays show bilateral patchy to extensive consolidations, and bronchial lavage yields a milky fluid. 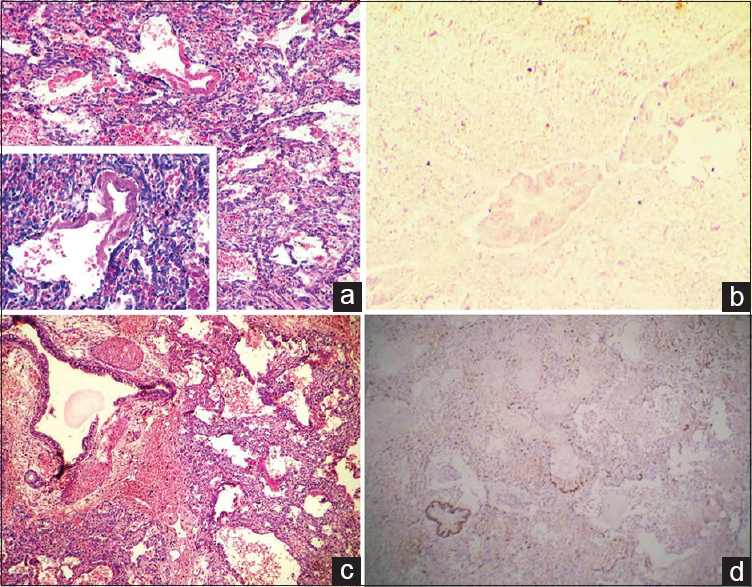 Characteristic microscopic findings on lung biopsy include filling of terminal bronchioles and alveolar spaces by deep pink granular PAS-positive material. Whole lung lavage is the safest and most effective form of treatment. We present brief profiles of two young children identified as having PAP, along with follow-up data on one of them. 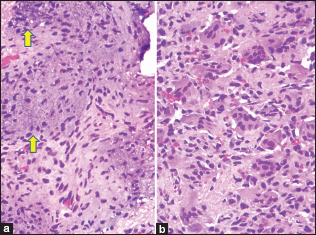 Superficial CD34-positive fibroblastic tumor is a recently described soft-tissue tumor entity. A 48 year-old-male presented with a gradually increasing soft-tissue mass in his right forearm of 2 years' duration, along with multiple subcutaneous soft-tissue nodular lesions, and reminiscent of lipomas over his body. He underwent a wide excision of his forearm mass. Microscopic sections showed a circumscribed tumor in the dermis and subcutaneous fat, composed of spindle cells, inflammatory cells, including lymphocytes, plasma cells, and eosinophils, along with interspersed markedly pleomorphic giant cells containing moderate-to-abundant “glassy” cytoplasm, vesicular nuclei, exhibiting prominent nucleoli, and intranuclear pseudoinclusions. 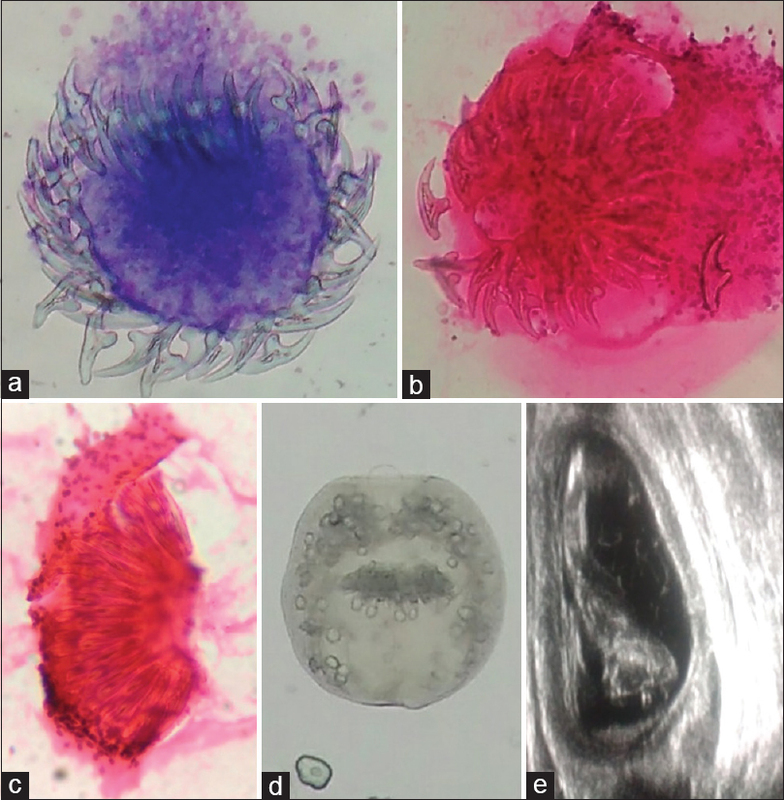 There were no significant mitotic figures, areas of hemorrhage, necrosis, or pigment histiocytes. By immunohistochemistry, the tumor cells were diffusely positive for CD34 while negative for cytokeratin (CK), pan CK (AE1/AE3), S100 protein, CD30, and CD31. MIB1/Ki-67 was low and highlighted 4%–5% tumor nuclei. Diagnosis of superficial CD34-positive fibroblastic tumor was offered. Sections from the various resection margins were free of tumor. Postresection, the patient is alive with no evidence of disease for the past 8 months. This constitutes as one of the first case reports of this rare tumor entity from our country. Its diagnostic and treatment implications are discussed herewith. Intramuscular lipoma is an uncommon variant of lipoma that occurs inside muscle tissue. Pathogenesis is thought to be related to neoplastic activity of mesenchymal stem cells, but there still is not an established theory. This entity can be found in almost all areas of the body, mostly within or in connection with skeletal muscle tissue. We have encountered an atypical intramuscular lipoma located in the epidermal layer of the right thigh of an otherwise healthy 35-year-old female. The superficial, protruding skin mass resembled a sebaceous nevus or skin malignancy but was histologically composed of well-defined adipocytes between a mixture of muscle fibers, corresponding with the diagnosis of intramuscular lipoma. Intramuscular lipoma of the skin has never been reported before; thus, the authors suggest the classification “cutaneous” intramuscular lipoma to describe lesions located in the dermal or epidermal layer. Chondroid syringoma (CS) also known as mixed tumor of the skin, is a rare benign adnexal tumor accounting for < 0.098%. Epithelial cells arranged in cords and tubules set in myxoid or chondroid stroma. Differentiation such as osteoid, sebaceous or mature adipocytes can be seen rarely. Hyaline cell rich is a rare variant of CS composed of cells with eosinophilic hyaline cytoplasm and plasmacytoid features. CS can have benign, atypical and malignant variants. The term atypical mixed tumor is recommended for those tumors which have histological features of malignancy such as infiltrative margin, satellite tumor nodules and tumor necrosis but without proven metastasis. Very few case reports of hyaline cellrich benign CS have been reported in the past, but to the best of our knowledge, possibly it is the first case of atypical hyaline cellrich CS of the little finger in a 65 year-old female showing divergent differentiation. We analyzed the clinicopathological features of renal-type clear cell carcinoma (RTCCC) in the prostate and its diagnosis according to the example in our hospital and review of the literature. Clinicopathological features of RTCCC in the prostate were observed in a patient from our hospital combining with a review of the literature. Microscopically, the tumor was composed of cells with abundant and translucent cytoplasm, arranged in the form of the vesicular nest or glandular structure. Therefore, it was necessary to distinguish between metastatic clear cell renal cell carcinoma and primary RTCCC in the prostate. Immunohistochemistry (IHC) of this case showed tumor cells were positive expression for cytokeratin (CKpan), low-molecular weight cytokeratin, epithelial membrane antigen, and prostate-specific antigen (PSA), P504S, prostate-specific membrane antigen and partial positive expression for vimentin and CD10. The tumor cells displayed negative expression of high molecular weight cytokeratin, cytokeratin 7 (CK7), CK34, PAX8, and renal cell carcinoma. 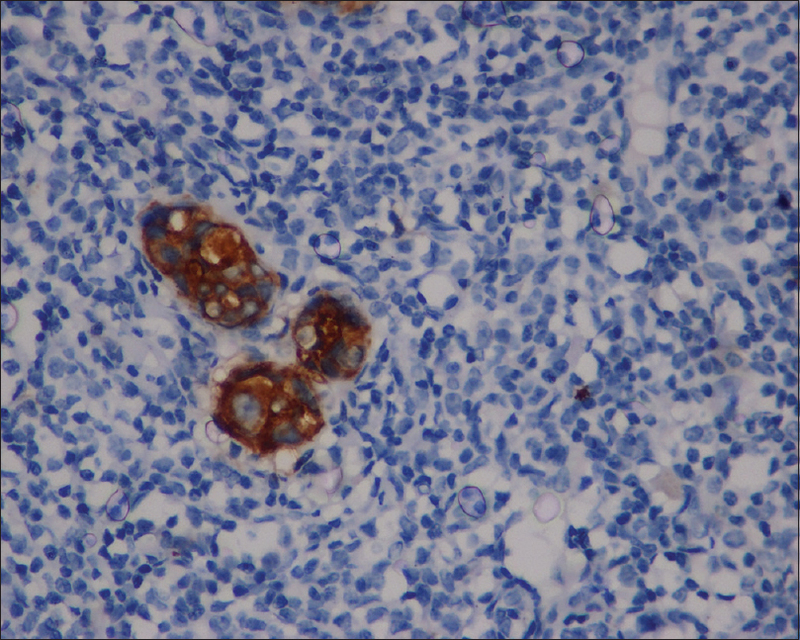 The morphological and immunohistochemical features of this tumor were in correspondence with RTCCC of the prostate. This tumor is a rare variant of the prostate carcinomas. To the best of our knowledge, this type of extrarenal tumor has only been reported in six previous studies. 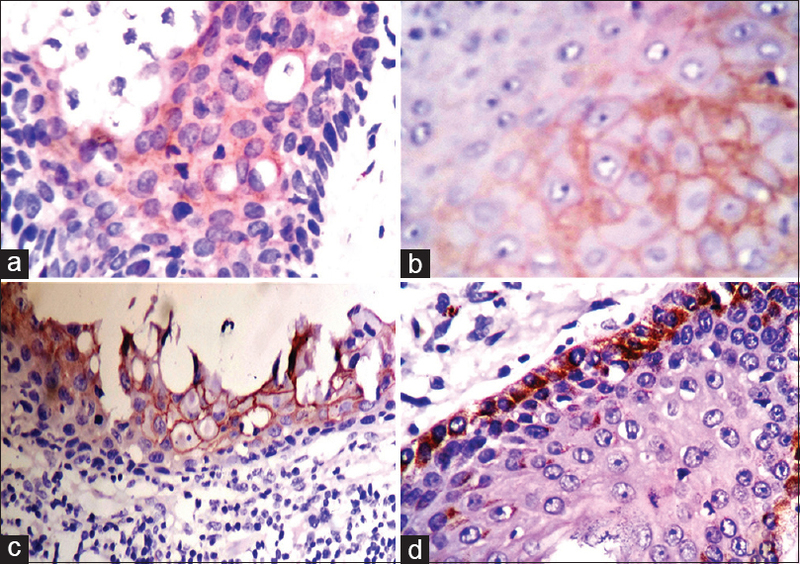 Combination of histology, IHC, imaging, and serum PSA is needed to perform a suitable diagnosis. We report a rare case of an 83-year-old male with synchronous occurrence of prostate adenocarcinoma and multiple myeloma. He presented with lower back pain and incontinence of urine for the past 6 months. Routine hematological and biochemical investigations were performed which pointed toward prostate adenocarcinoma. Transrectal ultrasonography and magnetic resonance imaging showed prostatomegaly along with osteolytic lesions in the skull and vertebrae. Prostate biopsy was performed and adenocarcinoma was confirmed. To rule out metastatic deposits in the bone and to rule out bone marrow infiltration, bone marrow aspiration and biopsy of the patient was done, and unexpectedly, it showed multiple myeloma. The association between these two disorders is poorly understood, but some studies show that bone marrow microenvironment plays an important role. Spermatocytic seminoma (SCS) is an indolent germ cell tumor of the testis. It has an excellent prognosis and orchidectomy is generally curative. Very rarely, it can be complicated by a sarcomatous transformation which is associated with a very aggressive behavior and requires adjuvant therapy. 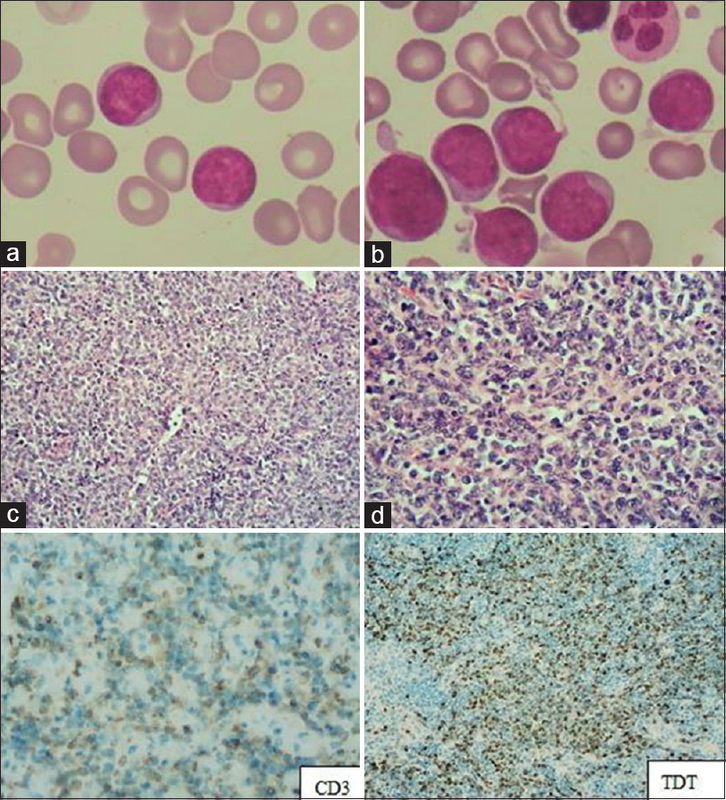 SCS with sarcomatous component is a very rare occurrence with <20 cases described in the world literature of which eight showed rhabdomyoblastic differentiation. We report a case of SCS with rhabdomyosarcomatous differentiation in a 60-year-old male along with a short review of literature. Uterine adenosarcomas are uncommon tumors. It is a biphasic tumor with both epithelial and mesenchymal component. The epithelial component is benign in nature, and the mesenchymal component is malignant. Metastasis is rare in adenosarcoma. 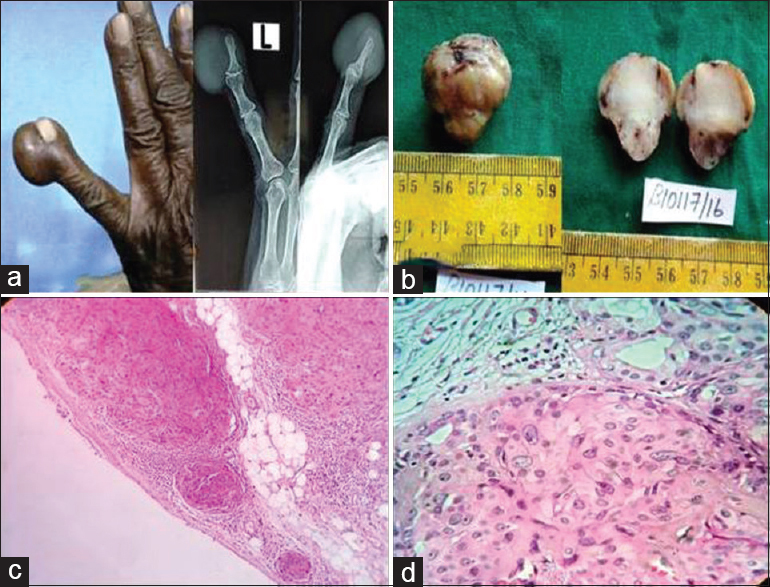 We report a case of adenosarcoma with lymph nodal metastasis. A 20-year-old female presented with history of per vaginal bleeding for 1 month. Per vaginal examination revealed a fungating mass protruding through the cervical os. 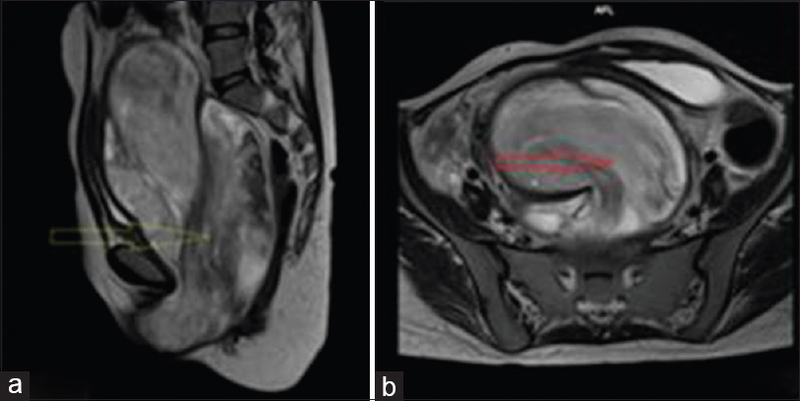 Ultrasonography and magnetic resonance imaging showed a large intrauterine mass. Biopsy of the mass done at an outside hospital was reported as rhabdomyosarcoma. Hence, she was given one cycle of neoadjuvant chemotherapy. Following this, she had profuse bleeding. Emergency hysterectomy with pelvic lymph nodal dissection was performed. 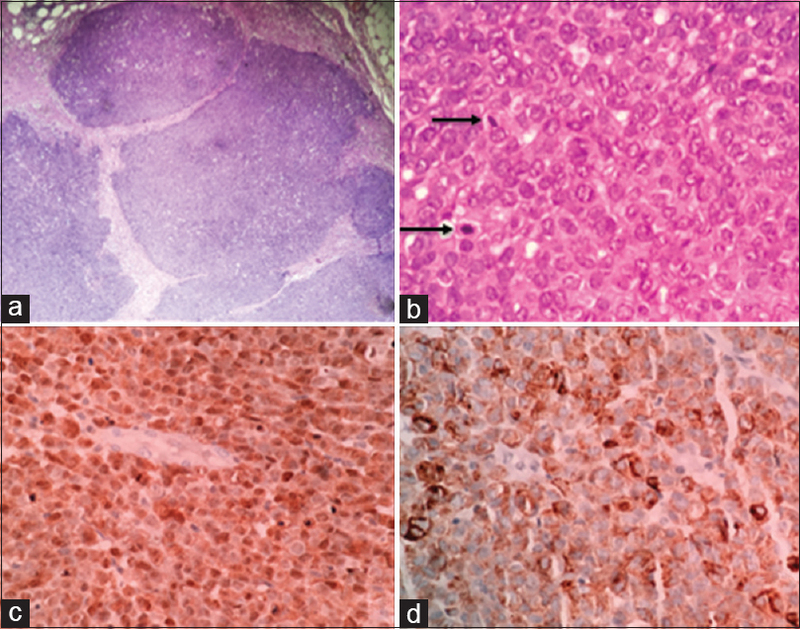 The final histopathology was reported as adenosarcoma. One pelvic lymph node showed metastatic deposit of rhabdomyosarcomatous element. 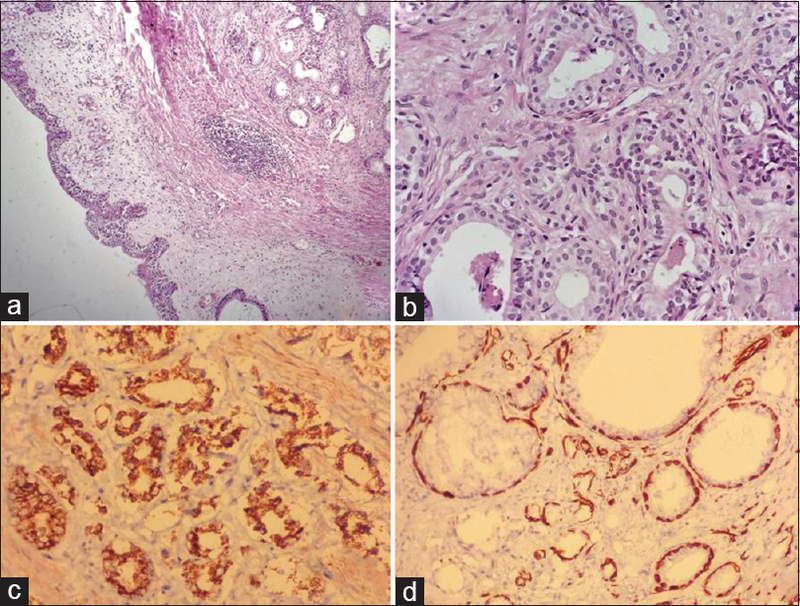 In young females presenting with polypoidal mass, uterine adenosarcoma can be considered in the differential diagnosis. Juvenile ossifying fibroma (JOF) is a rare benign tumor of the craniofacial bones differing from other fibro-osseous lesions in terms of early age of onset, aggressive clinical behavior, and high recurrence rate. Histopathologically, it is divided into two as trabecular JOF (TrJOF) and psammomatoid JOF (PsJOF). In PsJOF, psammoma-like spherical ossicles constitute pathognomonic histopathological images, whereas TrJOF has trabeculae of fibrillary osteoid and woven bone. Despite the histopathologic separation, both lesions have similar clinical behavior, thus the treatment procedure is also the same. Complete surgical resection is preferred for the treatment. We report a rare case of PsJOF involving the maxillary sinus and resultant facial symmetry in a 13-year-old female child. Primary follicular lymphoma (PFL) of gastrointestinal tract (GIT) is rare and account for 1%–3% of non-Hodgkin lymphoma. Within the small intestine, the PFL is more common in jejunum than in the ileum. Due to low prevalence of the disease, the clinical manifestations are not well known, and diagnosis is usually delayed leading to complications. We herein report a case of PFL of GIT who presented with intestinal obstruction and unique gross morphology. Diagnosis was made by morphology and supported by immunohistochemistry.